The exhibition commemorates the bicentenary of the greatest American poet of the 19th century. Born May 31, 1819, Walt Whitman wrote poetry that served as a bridge between the Transcendalist poets of his time and the more realistic poetry that emerged in the 20th century. During the Civil War, Whitman moved to Washington, D.C., and volunteered as a Union nurse. His volunteer work inspired him to return to poetry, publishing Drum-Taps, a collection that bore witness to the violence of war. 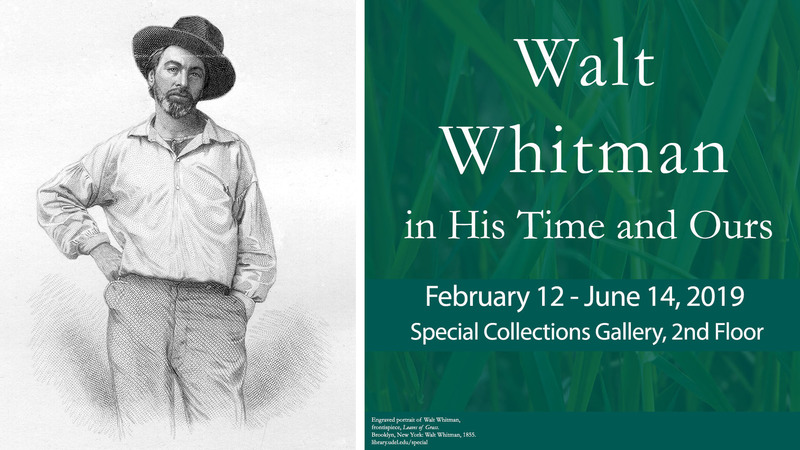 The exhibition examines Whitman’s life and work in the context of the era in which he lived, exploring his influence on other writers as well as American life and culture. Among the works on display are first and early editions of Whitman’s books, writings by his contemporaries and associates, fine press editions of his work, and work by authors who bear witness to his lasting legacy. Today, Whitman—often called “the father of free verse”—is considered one of the world’s most influential poets. His masterpiece Leaves of Grass is a landmark in the history of American literature.